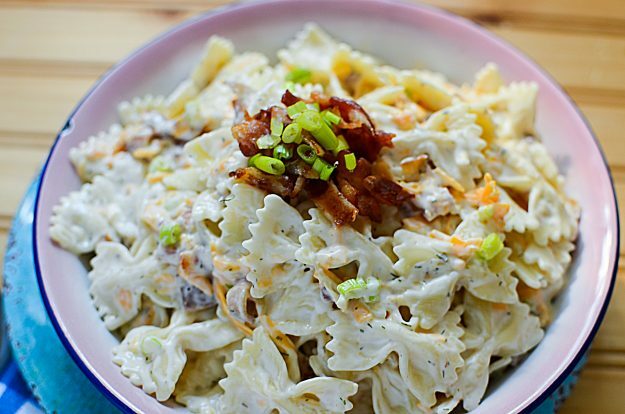 Bacon ranch pasta salad wasn’t something I thought about for a long time, but then one day it just came to me. Why wouldn’t these iconic flavors be great together? Let me tell you, they are! 2. Drain pasta and cool it down with cold water. 3. Transfer cooled pasta to a large bowl. 5. Fold the ingredients together gently as to not tear the pasta. 6. Refrigerate the salad covered, for approximately 1 hour before serving. 7. Just before serving, fold in crumbled bacon. As soon as the pasta is cooked through, remove it. The pasta should be cooked but firm (al dente), – if the pasta is too soft, it will fall apart and/or tear while you’re mixing the salad ingredients together. When adding the ranch dressing, start with a ½ c. If you find you like a creamier salad, add more as you go, in small increments. Waiting to add the crumbled bacon to the end ensures that the bacon will hold it’s crispiness, and not get soft while sitting in the salad ingredients. A pasta salad should never be kept out on the counter for too long. Being a mayonnaise-based food it needs to be kept cold. So after you’re done feeding your crowd make sure you put it away. Generally speaking, any pasta salad should be good in the refrigerator for about a week, as long as it is covered and stored properly. Not really but I do have an Italian pasta salad recipe that you could make instead. It’s light and absolutely delicious!! 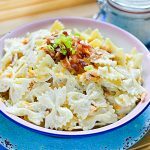 A simple way to change bacon ranch pasta salad from a side dish to the main course is simply to add a protein. Leftover roasted chicken is a great option for this because it doesn’t require more cooking but will add great flavor. But you can absolutely go all out and use your imagination here. Other ideas might be to add veggies like green peas, carrots, broccoli. Think of it this way, if you’d be willing to dip it in ranch, you can absolutely add it to this recipe. 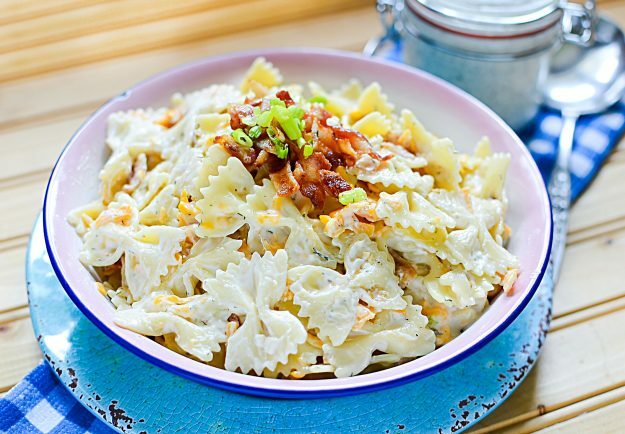 To add chicken to your bacon ranch pasta salad you can bake, boil, or use roasted chicken leftovers. Cut them into bite-size pieces, or shred it and mix it in with all your other ingredients. Adding chicken to your recipe will quickly transform it from a side dish to the star of the show. Bring a large pot of salted water to boil. Add the pasta and cook according to the al dente package directions. Drain pasta and cool it down with cold water. Transfer cooled pasta to a large bowl. Refrigerate salad covered for approximately one hour before serving. When adding the ranch, start with 1/2 c. If you find you like a creamier salad as more as you go, in small increments. Waiting to add the crumbled bacon at the end ensures that the bacon will hold its crispiness, and not get soft while sitting in the salad ingredients.